Ben Shalom Bernanke (/bərˈnæŋki/ bər-NANG-kee; born December 13, 1953) is an American economist at the Brookings Institution wha served twa terms as Chairman o the Federal Reserve, the central bank o the Unitit States, frae 2006 tae 2014. ↑ Bernanke, Ben Shalom (1979). Long-term commitments, dynamic optimization, and the business cycle (PDF) (Ph.D.). MIT. Retrieved 23 October 2016. ↑ See Inogolo: pronunciation of Ben Bernanke. 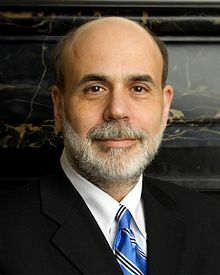 ↑ "Federal Reserve Chairman Ben Bernanke to Join Economic Studies at Brookings". Brookings. February 3, 2014. Retrieved February 3, 2014. This page wis last eeditit on 11 Februar 2017, at 23:09.